Cotangent graph is opposite to that of tangent graph. For some values of x, sin x has 0 value. for these values the denominator becomes zero and the cot x is undefined at these particular value. So there is a gap and discontinuity. The periodic function of cot x is π This means it repeats itself after each π as we go left to right on the graph. So considering the values of cos x and sin x for different values of x we can sketch the graph of y = cot x as follows. Note that there are vertical asymptotes (the blue dotted lines) where the denominator of cot x has value zero. 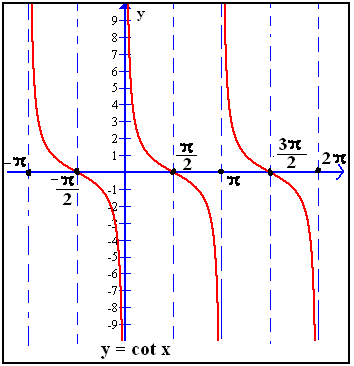 As there is a phase shift in the sine and cosine graph, in the same way there is a phase shift in cotangent graph. ⇒ x = -c/b which is the first cycle. For every cycle add k(π/|b|) that gives you the asymptotes. 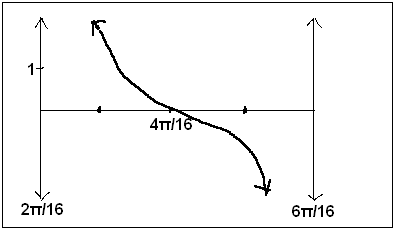 As there is 4x so divide the cycle in 4 pieces of length and as there is negative sign, the phase shift is at left. It will start from π/8 = 2π/16 and then add π/16 to each cycle. It will end at π/8 + 4π/16= 6π/16. b) Find the equation of vertical asymptote. c) Graph the given function.